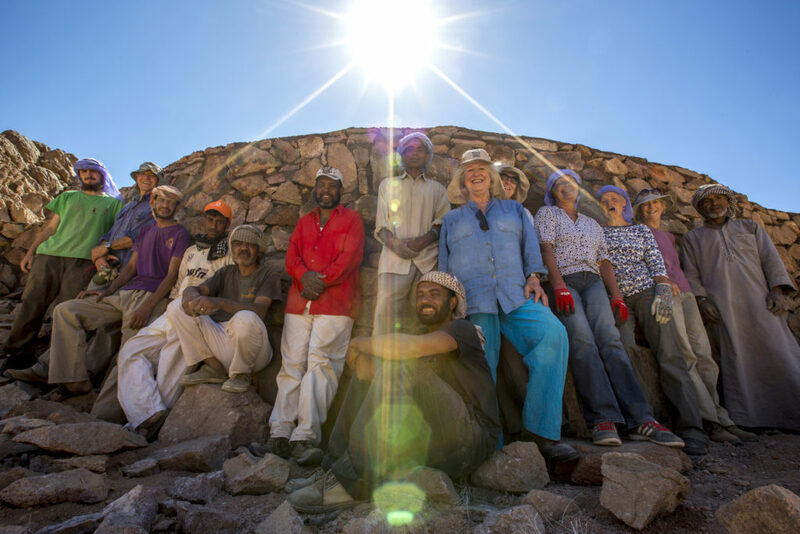 The story of the latest journey from Rachel Devas, journey initiator. Although the group was coming from many different places, Scotland, the Lake District, Hertfordshire and more, we all managed to meet up in the Heathrow departure lounge of Egypt Air. All well, and then we spent three hours sitting in the plane on the tarmac. So we arrived at Cairo around midnight with no hope of an on-going flight to Sharm el Sheikh and our hotel rooms at Umbi Diving in Shark’s Bay. But all praise for Egypt Air who, after having got our visas, very quickly got us on a bus to Le Passage Hotel where we were allocated rooms – not for very long – as we had to leave again at 2.30am to catch our 4.30 flight to Sharm. I was able to ring our Hotel at midnight from Cairo and explain what was happening and they arranged to meet us with their minibus on our arrival at Sharm the following morning. So although we were all rather tired we weren’t grumpy. The hotel was just perfect and after some sleep and breakfast we all swam amongst the most amazing coral and beautiful fish right there at the end of the wooden jetty. Fredi had his goggles and snorkel which we all borrowed and later he went diving. We slept, then had lunch and much refreshed climbed into Sala’s minibus and headed for the mountains. 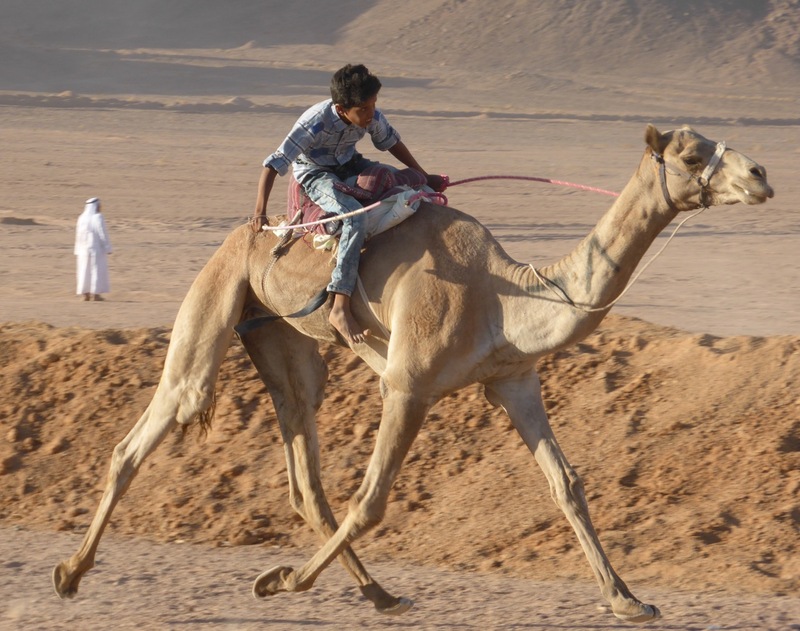 two camels who had spent the whole race almost glued together side by side. So there was a dilemma as to which one had come in second and which third. However Fredi had been spotted taking a photo and was called upon to help with a ‘photo finish’. We arrived at Fox camp and had tea and karkaday which was perfect, and then found our rooms etc. and had supper. The next morning (Monday) we all set off for the mountains, picking up Shaban in Amran Garden and then on up Wadi Tala and through the chimney and on and on. It was quite a long walk but the group were really great and happily surprised at how well they managed with all the scrambling over the big rocks. from containers filled from the tap. The food was excellent with Eid in charge and we had good snacks to keep the energy levels up. We had passed the dam site on our way up and seen Mahmoud and his team busy preparing the ground rock for the base of the dam. 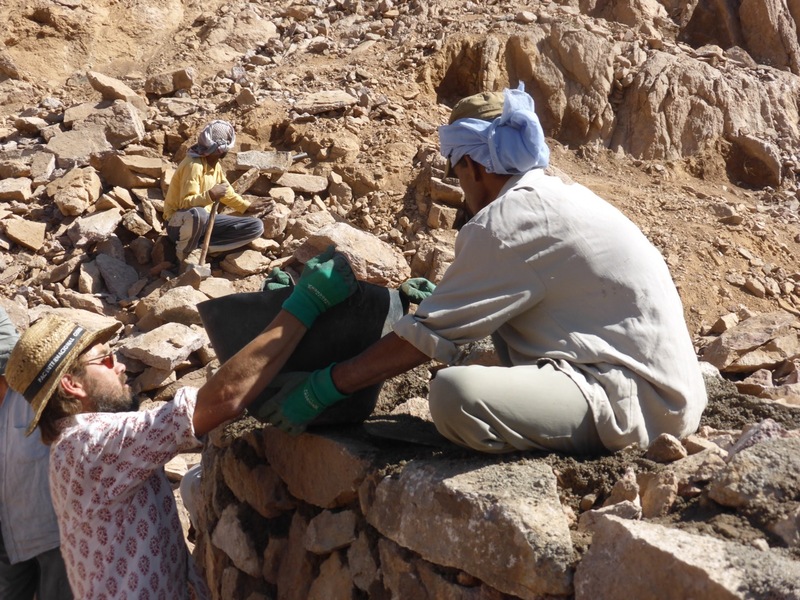 So the next day we joined the bedouin team and got building. 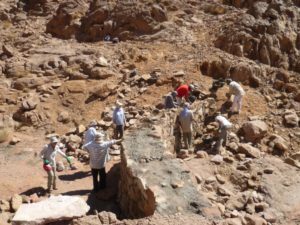 The site was particularly good not only for it’s situation in the Wadi with a large catchment area of rain water but also because there was a large supply of stone near the dam and the sand and cement mixing was close by with water in an improvised burka just above. time to build the sides up any higher I don’t know but this certainly created a very good buffer for the water before it arrived at the dam. I noticed in the photos of the dam now full that the dry stone dam is below the water level. As usual, Mahmoud had organised everything for the build impeccably. The water supply had been complicated as it came from a long way away and he had had to arrange for a second pump midway to get the water to the site. This time stayed with the team and worked every day with the builders. It was so nice to have him with us. After lunch (Friday) we walked back down to St Katherine’s Village but this time we took the shorter route by Abu Giffa. The path was severely damaged in places and we made a photographic record of this as we went along. Now, since the bad storm two weeks ago, as Helen told us, it has become impassable for camels and donkeys. As our flights home didn’t leave until Sunday we had a whole day in St Katherine’s. 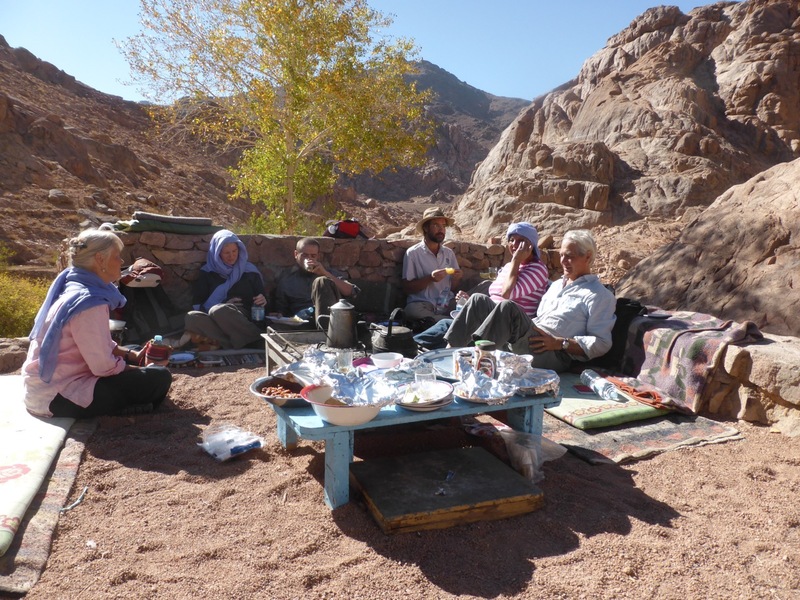 Everyone in the group wanted to come to the early service at St Catherine’s Monastery so we all had breakfast in the Refectory and then went to see the museum afterwards. The Bishop was at the service and beckoned me over to him. He was pleased to hear about the dam project and after the service Father Nilus (from Devon) offered to show us around the church and explained some of the tenet of the Greek Orthodox Church. He also took us into the Chapel of the Burning Bush which was a special privilege and later unlocked the gate to the Burning Bush so that we could see it close up with the beautiful mosaic done by Father Gregory, which stands beneath it. After lunch at Fox Camp, and as Selema was in Cairo, we went to Mohammed El Hashash’s house to see his collection of Bedouin Craft – bags of all sizes, cushion covers, belts, small purses and more. Between us all we bought quite a lot and he seemed very pleased with our visit. His prices are a little more than Selema’s were last year, the workmanship generally is good but he doesn’t have the subtlety of colours and variety of designs of those of Selema. We had a good last evening together at Fox Camp and then breakfast and off to the airport again. Joe and Fredi were keen to have some more time swimming at Shark’s Bay and so organised a taxi and left early in the morning and we collected them with a picnic lunch each on our way to the airport. They were very pleased to have the extra time with the coral and the amazing fish. 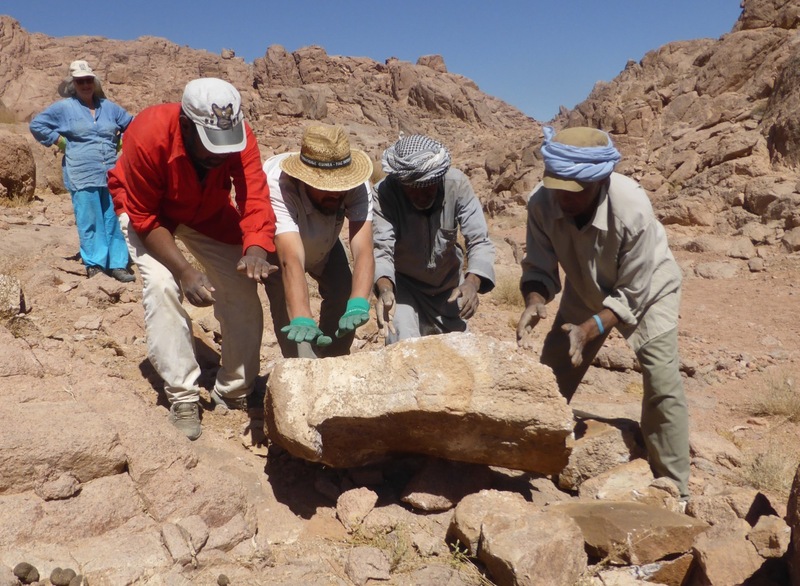 This visit to Sinai was the fourth trip for Helen since taking over from Susie last year. Where else to start but with – The Weather! 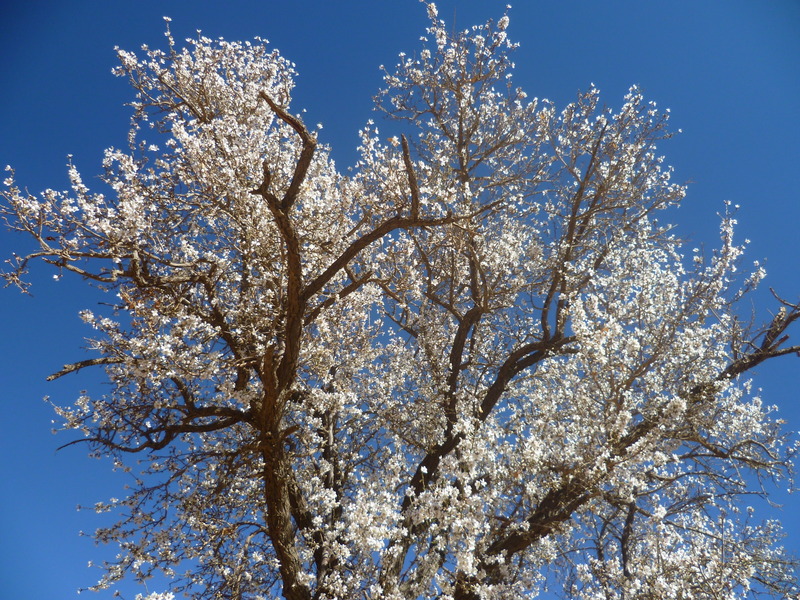 This winter there has been a great deal of rain in the desert east and south of St Katherine and so there were lots of large green bushes and leafy acacia trees plus some delicate flowers on road-side weeds – all looking very alive and well. Some Bedouin from the East coast had moved into these areas for grazing for their camels and goats, living the traditional lifestyle of their ancestors with goat’s hair tents. St Katherine’s has been less fortunate with precipitation as many wadis have only had a little rain and a bit of snow. They need more rain to fill up their wells and the dams. The fate of this journey and whether it would go ahead where not really in doubt, despite all flights from UK to Sharm El Sheikh being withdrawn following the bomb on the Russian airplane and the killings in Paris. Plenty of people thought going would be foolhardy and this did increase levels of anxiety while travelling and in Sinai, though their fears were all groundless. Mahmoud and I started work on Tuesday 24 November when I arrived at St Katherine’s after a longer journey via Cairo and an overnight stop in Sharm. Today Mahmoud, Faraj and I went by jeep to visit outlying areas. As well as some garden wells, these areas mostly have community wells, they providing water to as many as 10 large families, sadly are depleting due to the sever drought. 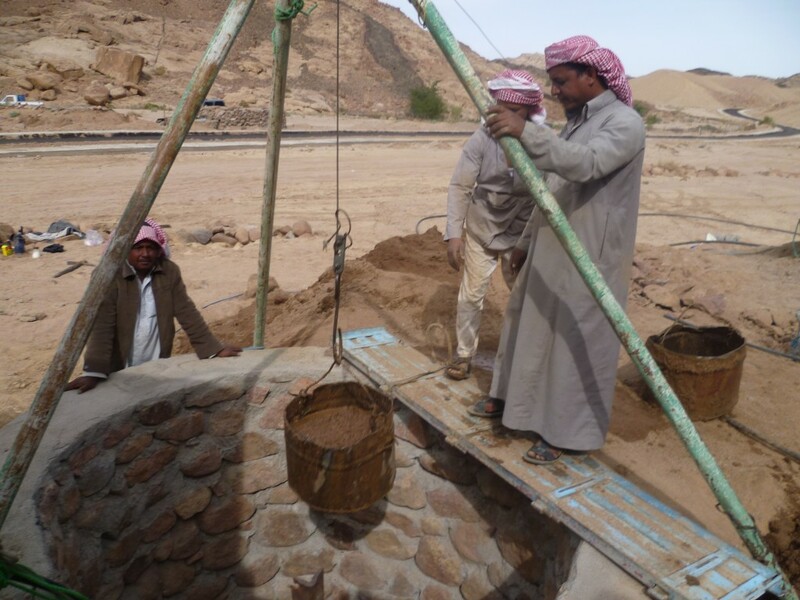 The only other water the Bedouin have access to, is tanker water provided by the government, it is brine water, which seems to cause kidney problems and make people sick. Thus, those communities really want good well water for drinking, and for growing their own food. Since, that there is no tourist trade in South Sinai, except for Sharm El Sheik, there is very little work for the Bedouin, the new water wells would help them to return to their traditional ways, growing fruit, vegetables, and Bedouin tobacco. Today we went to look at one well that has been funded by the Makhad Trust which provides water to part of the community in Wadi Tarfa. The well is some distance from the houses and is piped in via a hose that is 2000m long. 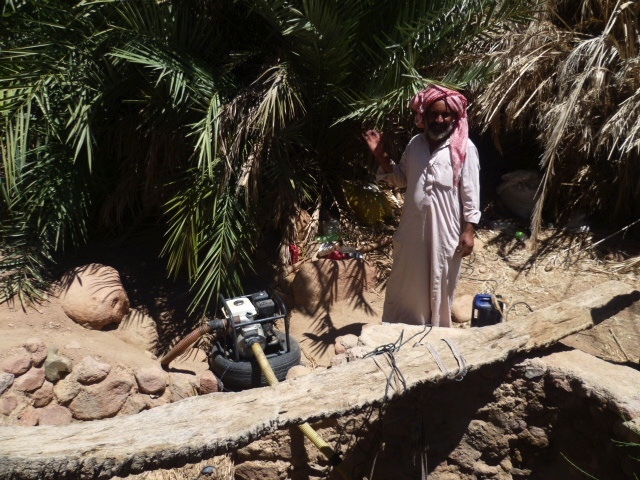 While we were there, we were asked to look at a nearby well to fund the restoration of too and the hose is nearly 3000m long. These wells bring good water but there is not enough. This is coupled with the problem of foxes and hyenas’ biting into the hoses to get water, so they constantly have leaks. The photo is of Ibrahim whose well we saw today. He has completed the work and is so happy to be able to grow lots of trees. His garden is his only source of income. The July trip, and Helen’s first wells trip in role, went very well. 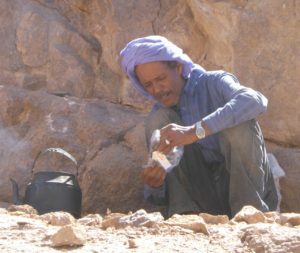 The weather was very hot, as one might expect in July, but it was rather too hot for the Bedouin who sought shade at every opportunity. The first fruits were in abundance and we feasted on mulberries and figs straight from the trees. 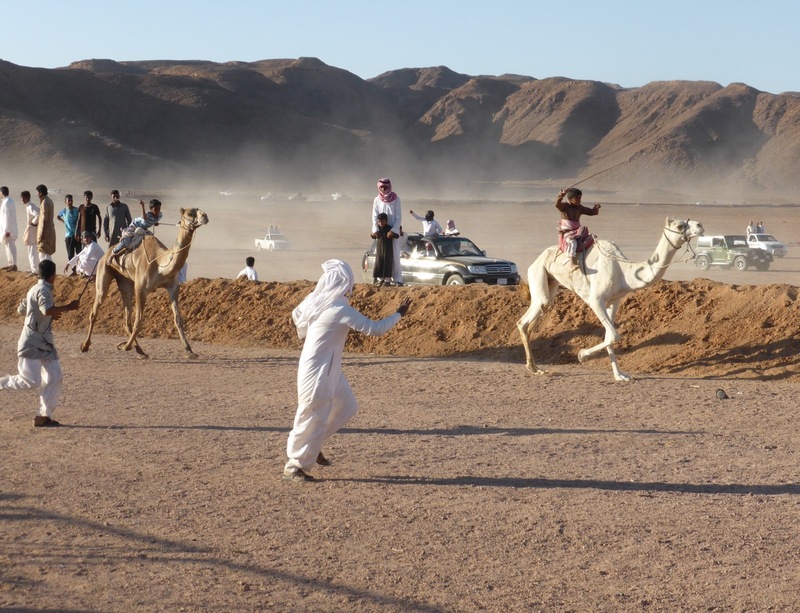 I am not sure whether most of the Bedouin actually noticed that ‘Susie’ had changed. 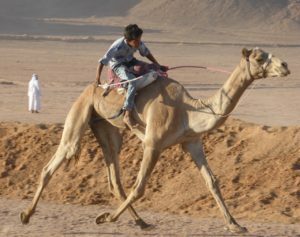 There was still a blond European woman bumping around the desert with Mahmoud and Faraj. Mahmoud often had trouble remembering he was with Helen and kept calling me Susie. We paid out all the money due to well owners, visiting all but one well (the owner was not available), added more to the waiting list and also visited Farhana in the library and initiated the Beekeeping project with Mousa. 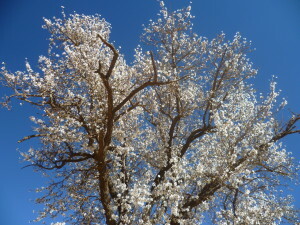 One site visit we made was to a small community beyond Tarfa on the Wadi Ferian road. 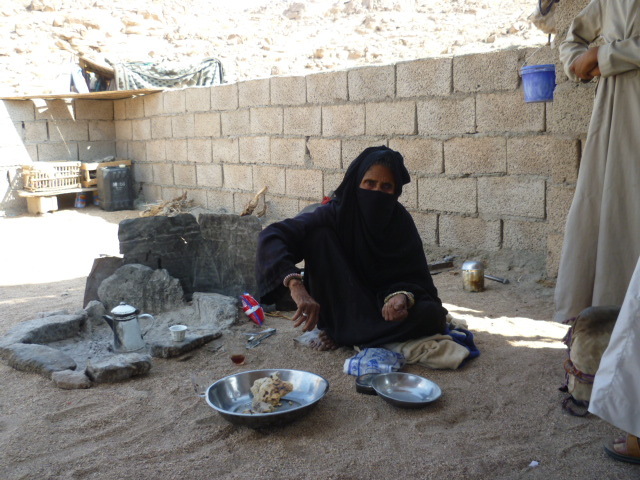 Salhe was the eldest woman of the village and obviously held in high regard. She still takes her goats out and sleeps in her tent most nights in the mountains like traditional Bedouin. When she is back in her village, her home is just an areesha with one wall and yet she seems reasonably content, except for the lack of water. Her well is the only one for her community and it is dry. The council water trucks often forget, sometimes for as long as a month, to bring the brackish water that the Bedouin will only drink if there is nothing else. We hope to help Salhe and her village soon. 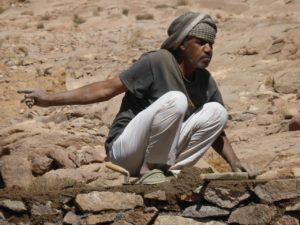 There were other similar stories of Bedouin just about managing without a local source of water but times are definitely hard for them. Here’s a new easy way to raise money for THE MAKHAD TRUST that does not involve parting with extra cash. Everyclick.com has launched a new way to donate – it’s been christened “Give as you Live”. It means you can search the web, shop on line from your favourite retailers, trade on eBay and raise money for THE MAKHAD TRUST. Our special address is http://www.everyclick.com/the-makhad-trust/1100377/0, all searches, shopping and eBay activity made from here will raise money for us. Everyclick has already raised over £5,018,201.14 for a wide range of charities around the UK, and Everyclick was voted website of the Year 2008 and has been recognised as a top 100 media tech company 2009. Discover the new way to give to THE MAKHAD TRUST. Give as you Live. The Makhad Trust started work in the Nawamis community to help them fulfill their desire to provide a school for their children. 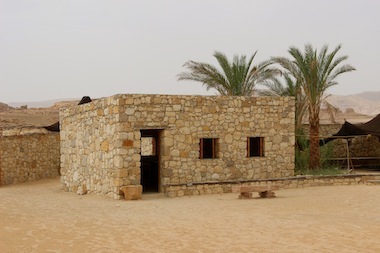 Long distances and a lack of infrastructure on the Sinai Peninsula disconnect villages and make it nearly impossible for desert children to attend school without leaving their home. This week the Makhad Trust was registered with eBay as a charity. This means that if you sell an item on eBay you can chose to donate part of the money to the Makhad Trust and if you are buying an item you can add an extra amount as a donation. You can also make a donation without buying or selling if you have a PayPal account. You can see our eBay for Charity page if you click on this link, this page lists any items that are making a donation to the Makhad Trust from their selling price. eBay for Charity has a list of over 6600 charities on it’s database and since 2006 it has raised over £36,500,000 for these good causes.